Rajasthani Panchme Dal, as the name says is a dal made up of five types of lentils. It is commonly paired with baati in the quintessential Rajasthani dish 'daal baati', but can also be served with rice or chapati. For long Rajasthan had been an arid land where water was scarce and hence fresh produce were not abundant. It reflects on the local cuisine quite predominantly. For example, in this dal, only dry ingredients are used. Of course, things are not same now and this dal can be adapted to one's taste buds. You can add sauteed onions and tomatoes too if you like. But, for now, I have kept this dal as simple and authentic as possible. I wish I could have captured it better in pictures. But, due to a lack of planning and execution on my part, I could not do it. I will update the pictures whenever I can. 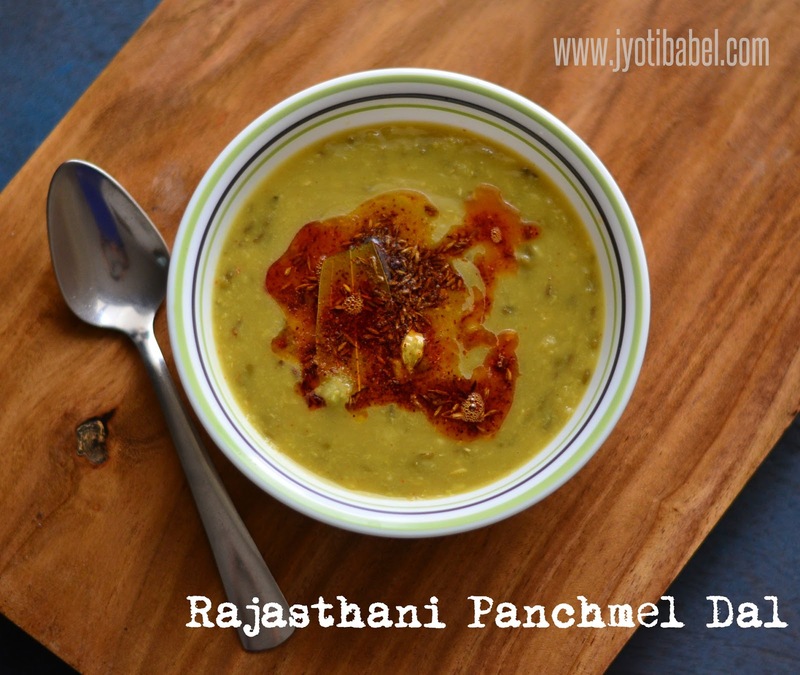 Let's check out the recipe for Rajasthani Panchmel Dal now. 1. Wash and rinse the dal with water 2-3 times before soaking it in fresh water for at least half an hour. 2. Take a pressure cooker (3 litres capacity is good), add the soaked dal (discard the water it was soaked in), salt, turmeric powder, ghee, and add 2 cups of water. 3. Cook it on medium to high heat for 5 to 6 whistles. Once done, let the pressure settle on its own, open the lid. 4. In a tadka pan, heat the ghee for tempering. Once the ghee is heated through, add the bay leaves, asafetida, and cumin seeds, cardamom and cloves. When it splutters, add the red chilli powder and pour the tadka over the cooked dal. 5. When serving add lemon juice if you like and serve hot with rice or as a side along with the main course. This Rajasthani Panchmel Dal is my entry for BM 88 Week 2 Day #2 under the theme 'Dazzling Dals'. For day#1 I had posted Restaurant Style Dal Tadka and for day #2 I had posted Chana Dal/Split Bengal Gram Curry Recipe. If you are on social media, take a minute to follow me there for all sorts of recipe updates. This is a simple recipe yet a delicious one. That tempering is so good and it would add a nice punch to the otherwise bland dal. 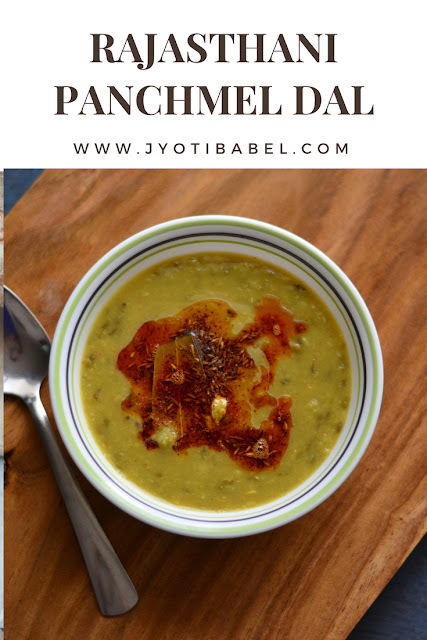 I love to combine different dals while making simple dal tadka, panchmel dal looks super comforting and my kind of food. Wow! Looks so appetizing. The tempering on top makes it so mouth watering. The tadka on the dal makes it so tempting. A simple dal with simple ingredients and yet so comforting. I love to mix lentils and cook. This is one of my favourite. Rich and filling meal. Good to know the authentic traditional way it is made. The dal looks so yum Jyothi. I love all our dals from different states and how comforting each one is to our everyday meal!..wonderful choice! Rajasthani dals are so simple yet so delicious......The bowl looks so tempting. Lovely presentation. I love these simple recipes without the overpowering gravy. Brings out the flavor of the dal perfectly. Nice one. The tadka looks so appetizing. I love this dal simple yet healthy and yum. Pnachmel dal is a classic Rajasthni dish and you have made it just perfectly.